The simple sound of “drip, drip, drip…” in a condo can cause serious panic. Is it rain outside? An air conditioning drip? A toilet or shower leak? As one leak can affect many floors of a condominium building, your worries aren’t just about your individual unit, but also those of your surrounding neighbors. So, when it comes time to remodel, it is critical that you and your neighbors select a condo remodeling expert to properly manage your investment and the complex nature of condominium renovations. Despite what others might say, expertise in the specialized niche of condominium remodeling can only be earned with time and experience. Over the past 20 years, BOWA has completed more than $35 million in condo remodeling in more than 30 different buildings. With that come the design strategies, relationships and proven methodologies required for success on behalf of our clients. 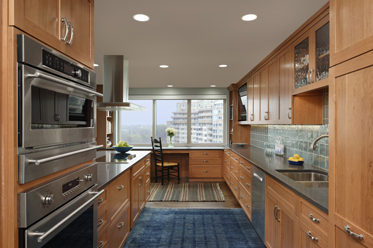 We’ve learned that successful condominium remodeling requires the delicate handling of the most difficult residential project combined with a thorough understanding of the complex systems of a commercial building. It involves a unique blend of the watchful supervision for which BOWA is known and a team of specialized laborers and subcontractors who appreciate and excel at the hybrid nature of these projects. Our experienced crews not only know the best materials, systems and construction practices to use, but they can also properly manage the unique requirements of these projects, such as noise abatement, access, safety, neighbor communications and cleanliness. Even after the renovation of your condominium is complete, BOWA is there for you providing additional peace of mind thanks to our industry-leading warranty and dedicated team of Customer Service professionals. The team provides 24/7 response for emergencies and prompt, knowledgeable service for maintenance and additional small projects to help ensure your project maintains its good looks and function for years to come. With a reliable resource already in place, the dreaded “drip, drip drip…” from your or a neighbor’s unit, can be more easily managed. With a reputation for delivering remarkable client experiences and superior construction quality, BOWA is not only a wise choice for the investment you’ve made in your condominium, but also in your peace of mind. 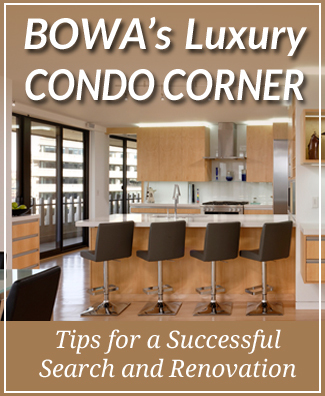 If you are considering or have already embraced the luxury condo lifestyle, make BOWA part of your team.